As soon as a person graduates, the first thing that he looks for is a job. With a gazillion people graduating from various universities and fields, it is becoming a difficult task to stand out among the crowd and bag a job which one is made for or compatible. A job for which the person will look forward to even after an drastically boring Monday. Employers on the other hand, may think that with the number of graduates looking for a job, they will get the best of candidates easily as there surely have to be the best among the crowd. However, to be one of those best candidates it is not an easy task. To make the best impression on the employers from the beginning to the end of the interviewing sessions along with maintaining one’s demeanor throughout the time while working under a particular firm can be quite exhausting. But as we all know, the best things in life do not come easily. Hence, below is a list of skills for work that the employers are looking for in the entry level position candidates. One of the most important career skills that an employer looks for in an entry level employee is the way he communicates. Good communication skills are a must have in any job. As communication is considered as the sole way of surviving in the competitive industry and climb the corporate ladder. Communication skills usually include the verbal skills or the oral skills, in which the way a person expresses his opinion and how well he manages to get the message across is considered. The second is non verbal skills. These strong skills include the way the person behaves or the way he presents himself while communicating and lastly written skills. The way in which a person is able to express his ideas, opinions and messages in a written form are the writing skills. If a person is well versed with the communication skills, he is considered to be a strong candidate by the employers. The ability to adapt in any given situation and to make the most of it is one of the skills that the employers are looking for in an entry level position. The candidates of the entry level position are graduates. They are more susceptible to change and adapt quickly to new situations. However, along with adaptability, the employers are also looking for candidates who can easily turn the adaptable situation in their favor and reap results out of the same. Graduates are one of the best bets for companies and employers as they can be molded and taught as per the company policies. One of the most important skills that a person should have in him for making a good impression on an employer is a positive attitude. People who have negative attitudes are not only difficult to work with but their presence also spoils the atmosphere at the work place. People with a positive attitude usually imbibe positive energies in the workplace and make the working process and task completion an absolute joy. It is easy to interact, work and exchange ideas with people with a positive attitude. To fulfill goals and complete tasks to perfection is one of the main motto of most of the companies and their employees. Graduates who know where they are going and what do they want to achieve in life are immediately considered as attractive by the employers. People who are goal oriented are considered more diverted towards their work and tend to work smarter as well as harder. Employers are on the lookout for people who are goal oriented as this will not only improve the name of the company but also enhance its performance on a large scale. Team work is considered to be one of the most important professional skills that the employers are looking for in an entry level position. Every individual at an entry level has to work along with others. The people in the team may or may not have similar thoughts and ideas like the candidate. Hence, in order to complete work on time and provide best results it is important for candidates to work peacefully in a team and learn to co-operate with one another. Candidates who are good at working in teams help in completing the projects assigned to them on time and deliver better results. Candidates who take their work seriously and honestly want to contribute to the company’s growth and development, and are considered as the most sought after employees by the employers. w hard working he is. People with strong work ethics are considered as gems by the employers as they have a sense of understanding towards their responsibilities and are willing to put the job first at the times needed. Initiative towards the work assigned is one of the most needed good qualities for a job which the employers expect from the new candidates. Initiative refers to how willing is a person to make sure that his work is to the point of perfection and is well researched. A person who takes initiative usually is more open with accepting challenges and does not let difficult situations affect his performance. Employees who show initiative towards the company and their employers are immediately considered to be well suited for the job. Problem solving skills refer to the ways in which a candidate is able to analyze and deal with situations which are unexpected and make the most out of it. Analyzing situations and getting the best solution to the problems is one of the skills that employers look for in the candidates applying for a job. People with problem solving skills are considered as very important in any company as they help in solving problems and deal with crisis in the most probable way possible. A person who has passion for whatever that he does usually tends to do his job with much better creativity and innovation than a person who is in a job just for the sake of it. 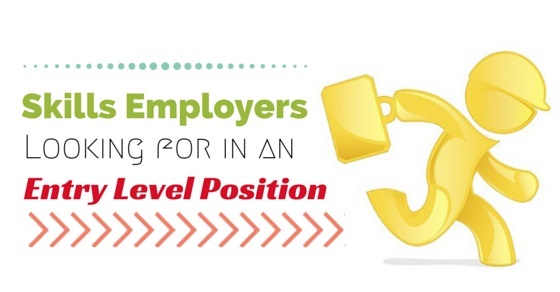 Employers are always on the lookout for candidates who are passionate about working in their corporation, as these candidates are easy to work with and are sure to give best results. Passion is something which comes from the heart and every individual who is passionate about his work is able to improve his skills and abilities and is more willing to improve himself as well as develop the company. Candidates should have the basic knowledge about the job for which they have applied. It is not only a way to show the employers that you are smart enough for the job but also so that they would not have to spend resources of the company just to train you about the basics. Knowledge about the basic working of the job is required in every company and people who do not possess this knowledge are considered to be non serious about the job. One of the most needed skill required for a person at the entry level careers is experience. The simplest way to gain experience is to intern at firms. No matter how good you are at the above skills, if you have no sort of actual experience you are considered as not good enough for the job. As most of the people are now resorting towards internships to understand the basics of the job and its working, the employers have a vast option of students to choose from. Hence, experience is considered to be quite an important factor in bagging an entry level job. Creativity is one of the assets which is developed with time rather than learned immediately. Innovative and creative candidates are considered to be gems by the employers as people who are creative are most susceptible to improve or innovate their final output of the work done. Creative persons not only help in improving themselves individually but also help in taking the company to different levels with their creativeness and innovation. Irrespective of all the skills mentioned above the most important skill is that of passion. As if a person is satisfied with his work, he will surely want to imbibe in himself the other skills which will help him excel. Previous articleHow Often Should You Update Your Resume Do You Know? Next articleWhat Do You Put in the Skills Section of Resume?